Sir Henry was more pleased than surprised to see Sherlock Holmes, for he had for some days been expecting that recent events would bring him down from London. He did raise his eyebrows, however, when he found that my friend had neither any luggage nor any explanations for its absence. Between us we soon supplied his wants, and then over a belated supper we explained to the baronet as much of our experience as it seemed desirable that he should know. But first I had the unpleasant duty of breaking the news to Barrymore and his wife. To him it may have been an unmitigated relief, but she wept bitterly in her apron. To all the world he was the man of violence, half animal and half demon; but to her he always remained the little willful boy of her own girlhood, the child who had clung to her hand. Evil indeed is the man who has not one woman to mourn him. “Good heavens!” I cried in amazement. The face of Stapleton had sprung out of the canvas. He burst into one of his rare fits of laughter as he turned away from the picture. I have not heard him laugh often, and it has always boded ill to somebody. I was up betimes in the morning, but Holmes was afoot earlier still, for I saw him as I dressed, coming up the drive. “Yes, I think that we should be more useful there at the present juncture.” The baronet’s face perceptibly lengthened. “Very good. I should be glad to get away as soon after breakfast as possible, so as to reach London in the afternoon.” I was much astounded by this programme, though I remembered that Holmes had said to Stapleton on the night before that his visit would terminate next day. It had not crossed my mind however, that he would wish me to go with him, nor could I understand how we could both be absent at a moment which he himself declared to be critical. There was nothing for it, however, but implicit obedience; so we bade good-bye to our rueful friend, and a couple of hours afterwards we were at the station of Coombe Tracey and had dispatched the trap upon its return journey. A small boy was waiting upon the platform. Wire received. Coming down with unsigned warrant. Arrive five-forty. Lestrade. His plan of campaign was beginning to be evident. He would use the baronet in order to convince the Stapletons that we were really gone, while we should actually return at the instant when we were likely to be needed. That telegram from London, if mentioned by Sir Henry to the Stapletons, must remove the last suspicions from their minds. Already I seemed to see our nets drawing closer around that leanjawed pike. Mrs. Laura Lyons was in her office, and Sherlock Holmes opened his interview with a frankness and directness which considerably amazed her. The lady sprang from her chair. “His wife!” she cried. 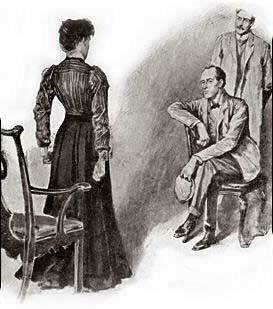 “I have come prepared to do so,” said Holmes, drawing several papers from his pocket. “Here is a photograph of the couple taken in York four years ago. It is indorsed ‘Mr. and Mrs. Vandeleur,’ but you will have no difficulty in recognizing him, and her also, if you know her by sight. Here are three written descriptions by trustworthy witnesses of Mr. and Mrs. Vandeleur, who at that time kept St. Oliver’s private school. Read them and see if you can doubt the identity of these people.” She glanced at them, and then looked up at us with the set rigid face of a desperate woman. “Our case becomes rounded off, and difficulty after difficulty thins away in front of us,” said Holmes as we stood waiting for the arrival of the express from town. “I shall soon be in the position of being able to put into a single connected narrative one of the most singular and sensational crimes of modern times. Students of criminology will remember the analogous incidents in Godno, in Little Russia, in the year ’66, and of course there are the Anderson murders in North Carolina, but this case possesses some features which are entirely its own. Even now we have no clear case against this very wily man. But I shall be very much surprised if it is not clear enough before we go to bed this night. ” The London express came roaring into the station, and a small, wiry bulldog of a man had sprung from a first-class carriage. We all three shook hands, and I saw at once from the reverential way in which Lestrade gazed at my companion that he had learned a good deal since the days when they had first worked together. I could well remember the scorn which the theories of the reasoner used then to excite in the practical man.